We arrived at our campsite in the Wabasso Campground a little after 6pm. 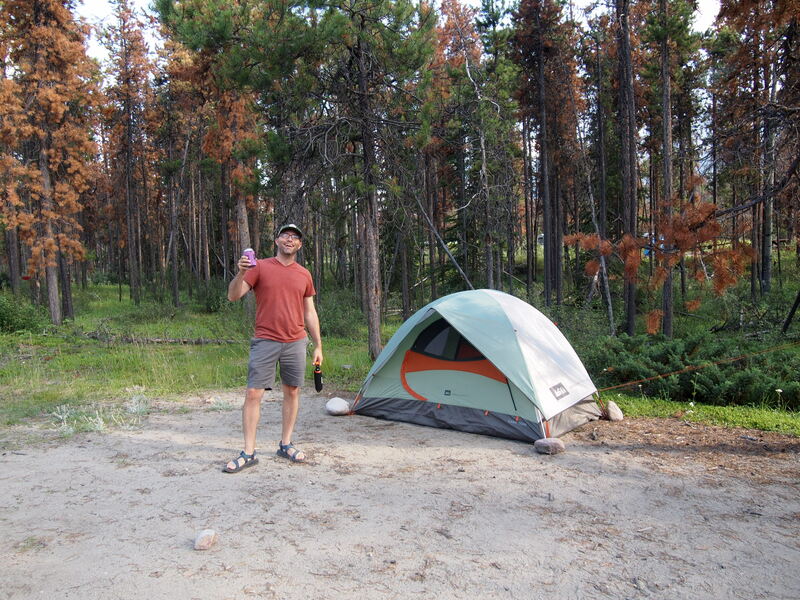 It wasn’t quite as nice as our site in K-Country, but it was sufficient. 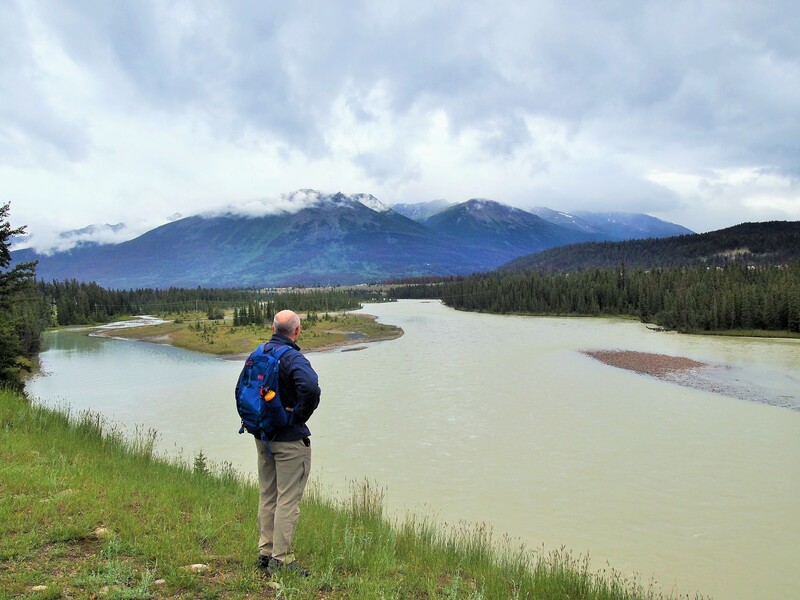 We were near the loop’s bathroom – which is heated even in the summer, thankfully – and a short trail from our site led to the Athabasca River. 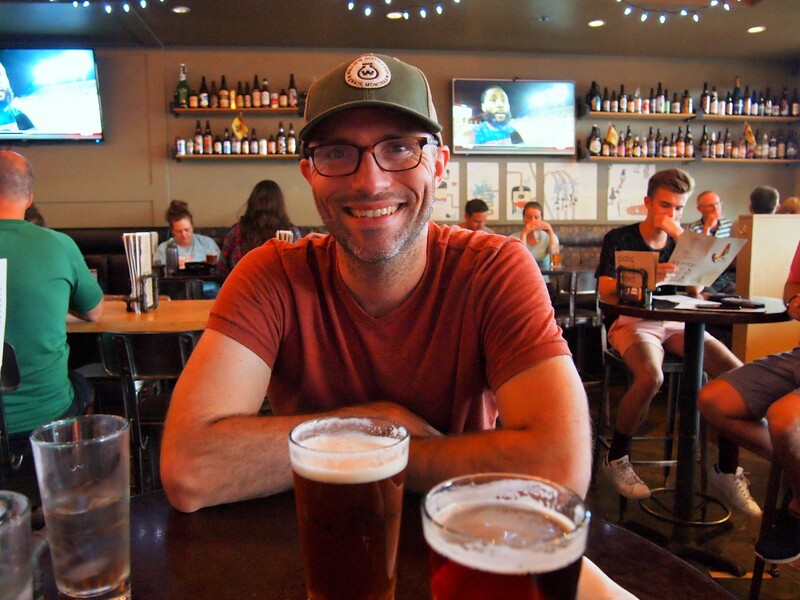 We decided to have a beer of our own before heading into town. It was a gorgeous evening, and I slightly regret not taking advantage of it. But it had been a long day, and we weren’t up to any evening hikes. 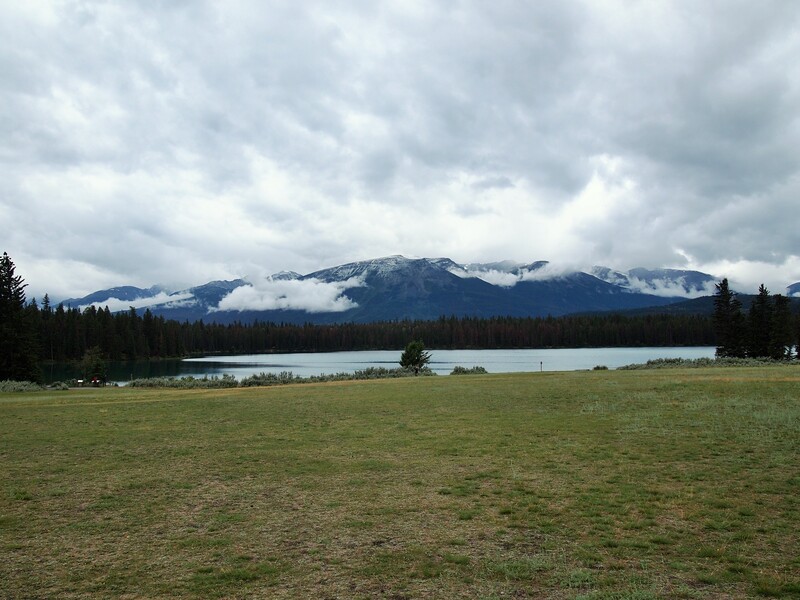 It was the nicest weather we would have our entire stay in Jasper NP. 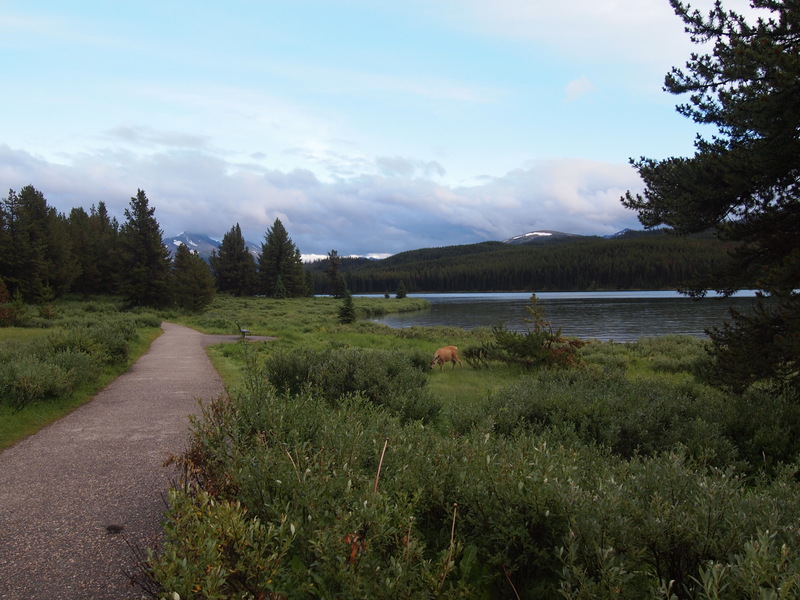 We woke to a light rain in the early morning, but it cleared out by the time we were up and moving around. 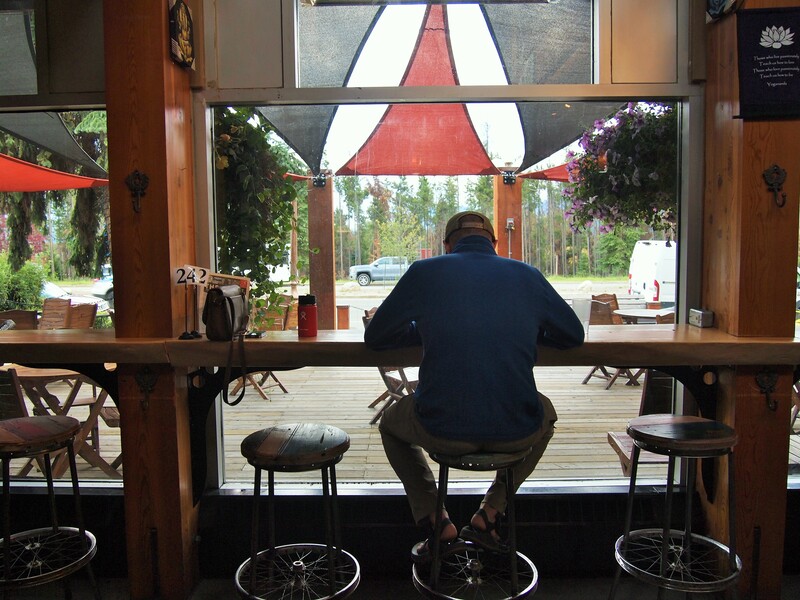 We decided to have a leisurely breakfast at Wicked Cup, a cozy outpost on the edge of town away from the main tourist bustle, while making plans for the day. We were hopeful for an overcast, but clear day of hiking. 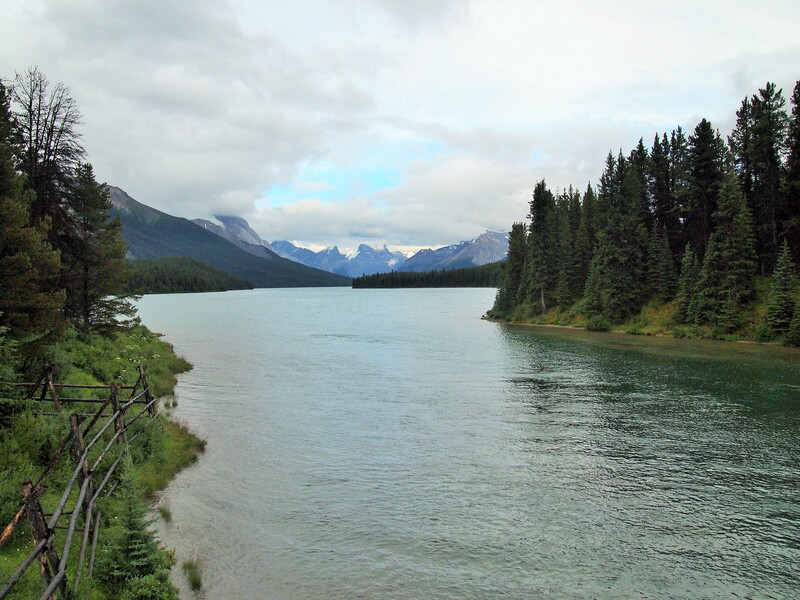 We had a rough idea of what we wanted to see in the day: Maligne Canyon and Maligne Lake. 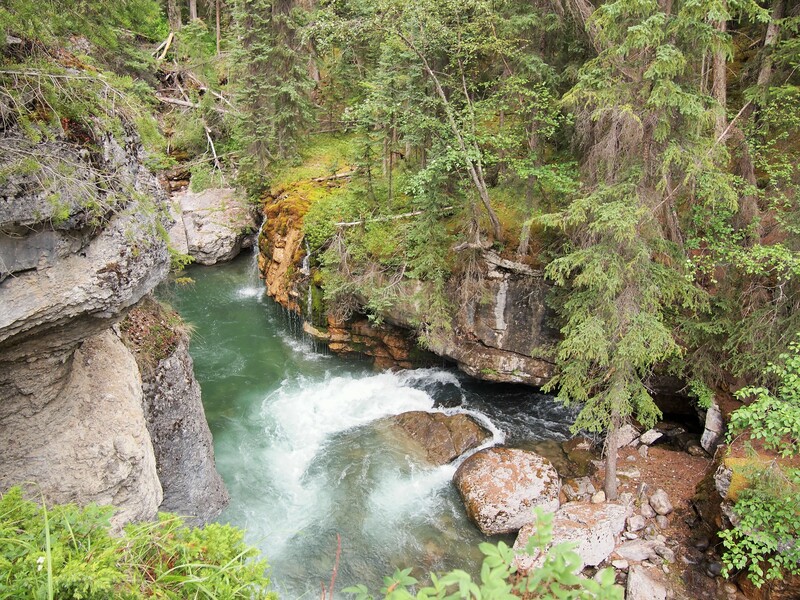 We opted to set out for Maligne Canyon first. 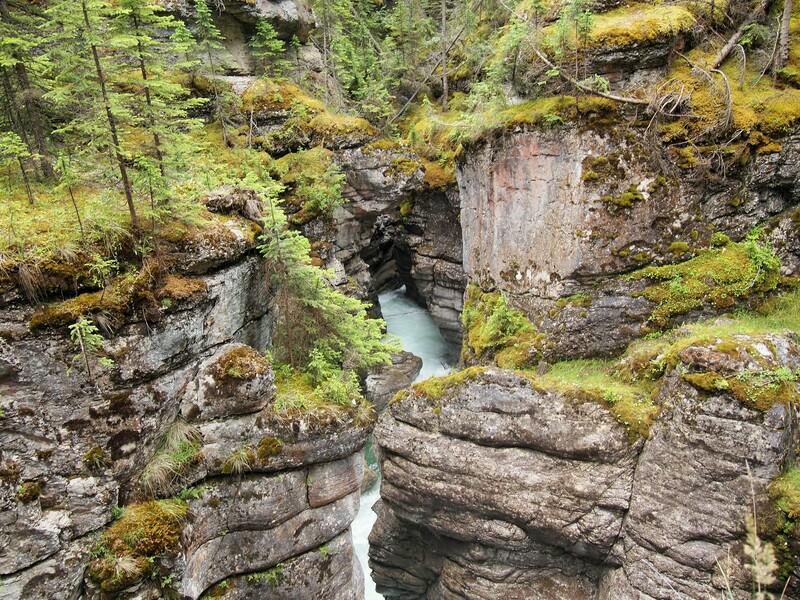 Maligne Canyon is one of the top sights in Jasper NP. 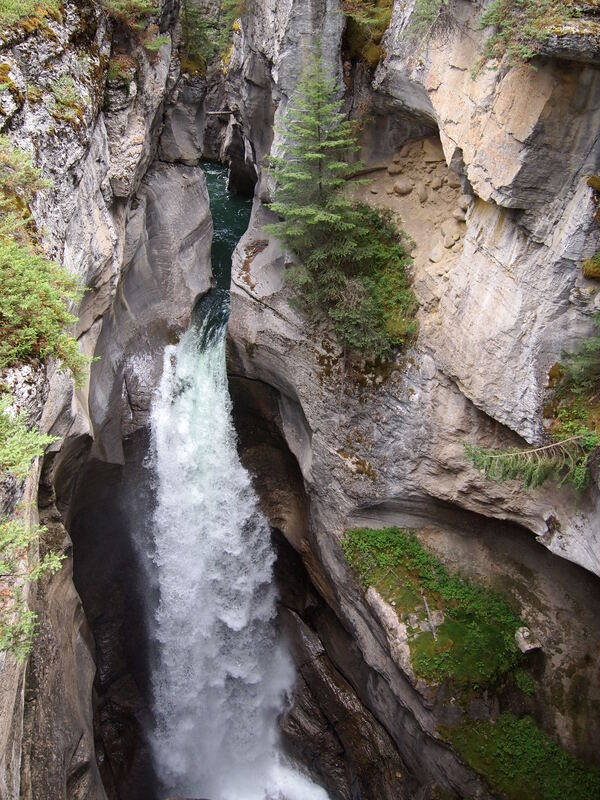 Carved by the fast-flowing waters of the Maligne River, the canyon is 165 feet at its deepest point. 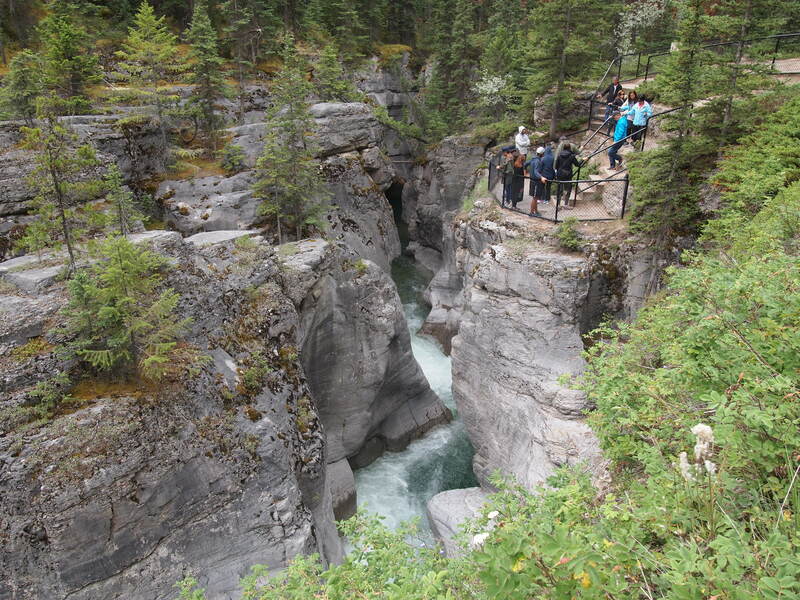 The top of the canyon remains so narrow in places that it would be simple to hop across. 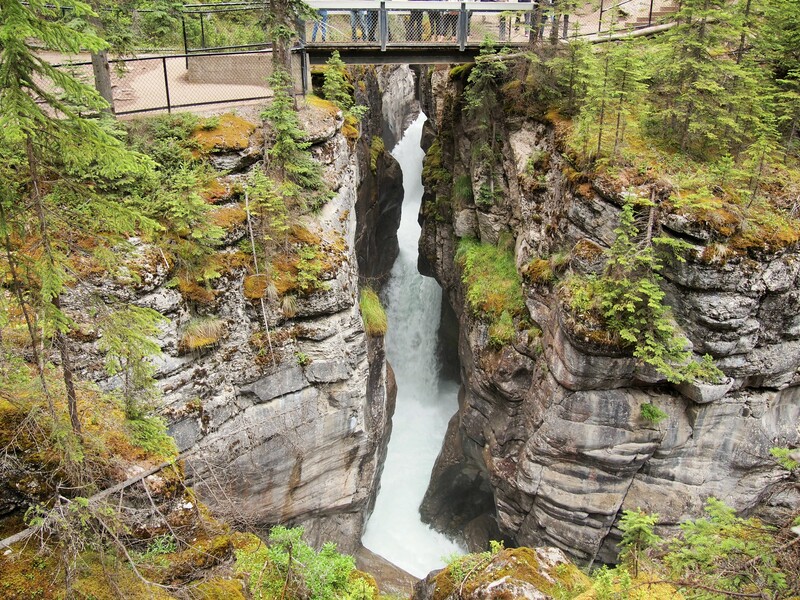 A series of six bridges crisscross the canyon and river. 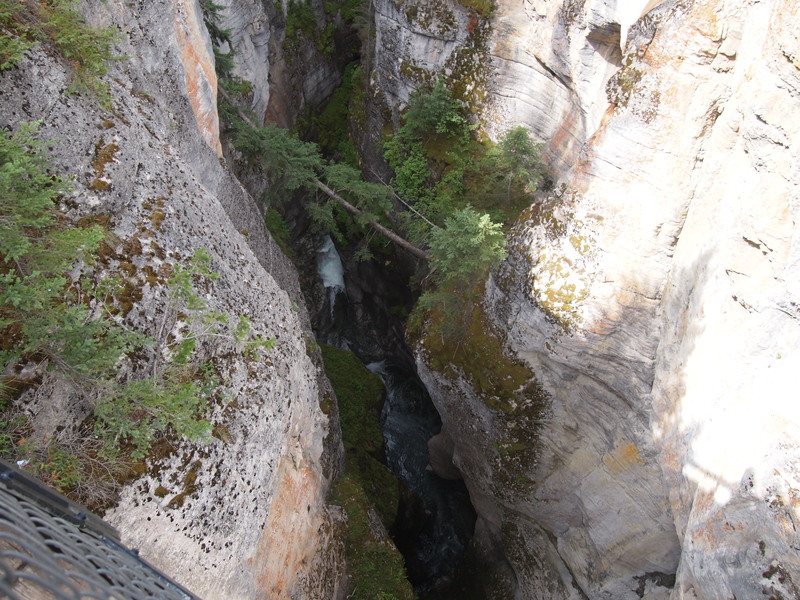 Most people begin at the top of the canyon, where a teahouse operates in the summer months, and walk down to the first and second bridges. 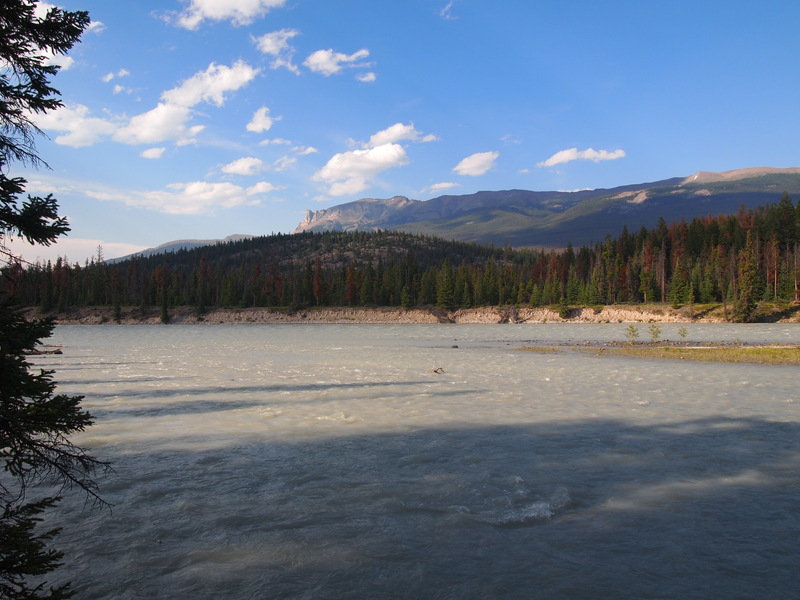 However, a trail leads from the parking lot down to the sixth bridge at the confluence of the Maligne and Athabasca Rivers. 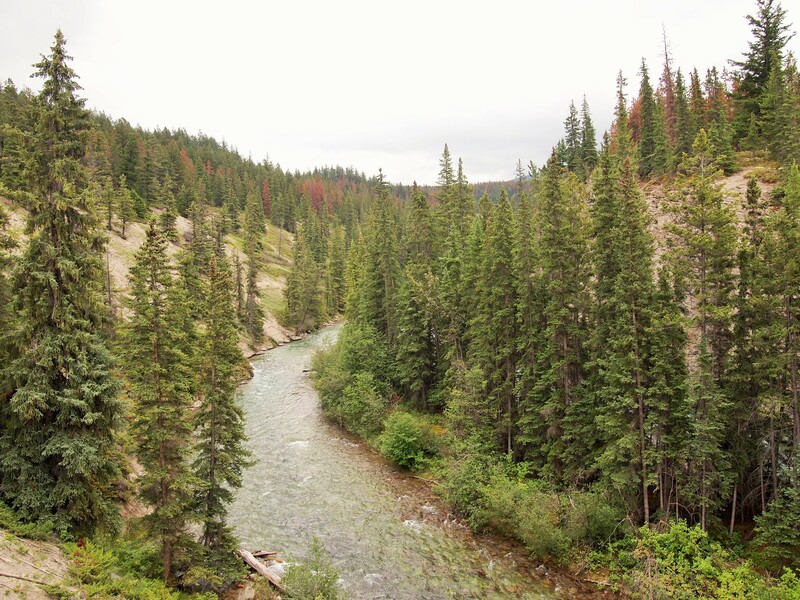 For a more comprehensive visit, we opted to start at Sixth Bridge, walk up the canyon, and loop back down. 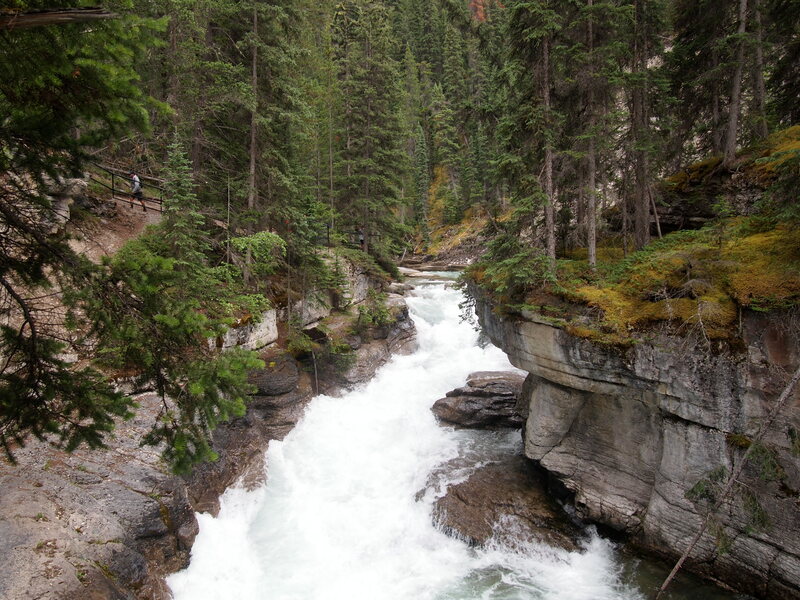 The beginning of the hike led us down a beautifully forested path alongside the Maligne River. The skies were overcast, but there wasn’t any rain or thunder – yet. After Fifth Bridge we climbed above the river for a nice view before slowly descending back to the river’s side. 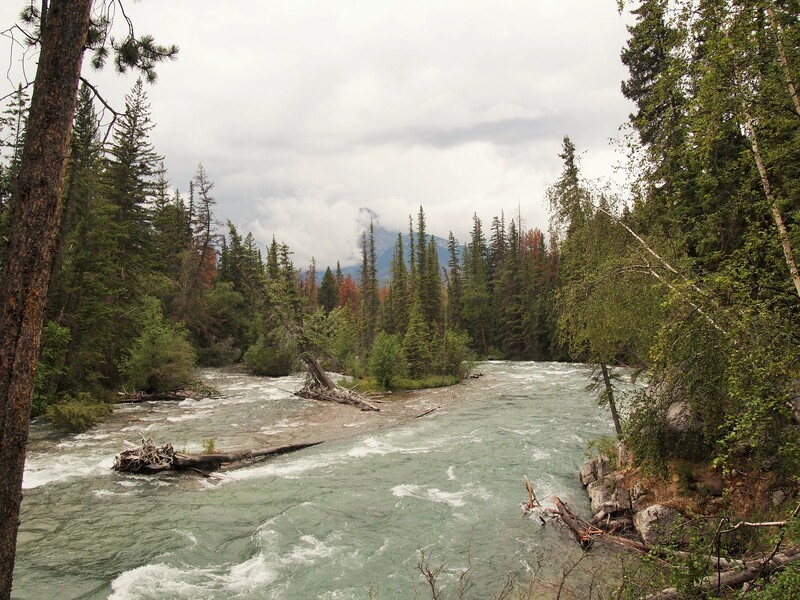 For the rest of the trail, we remained along the canyon’s rim, watching the progression as the river narrowed and plunged deeper into the gorge. 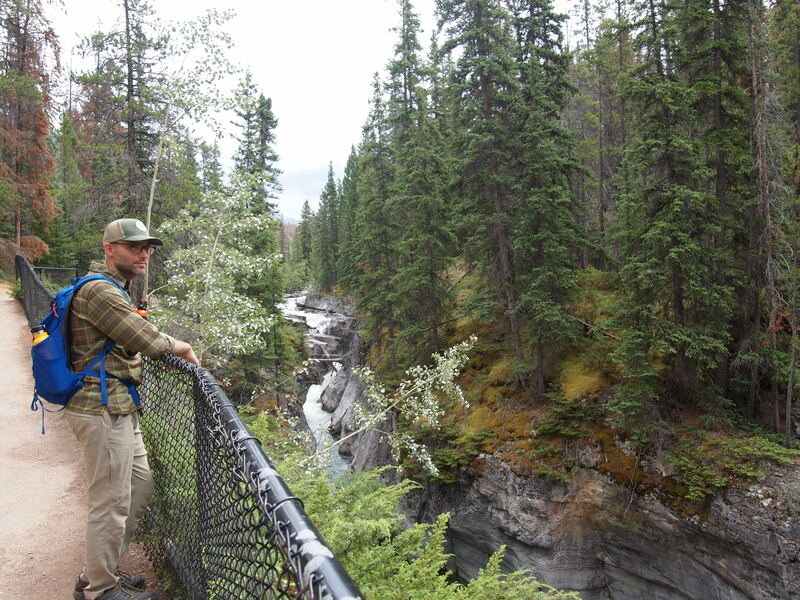 There were plenty of nice overlooks along the trail and each bridge crossing offered decent views as well. 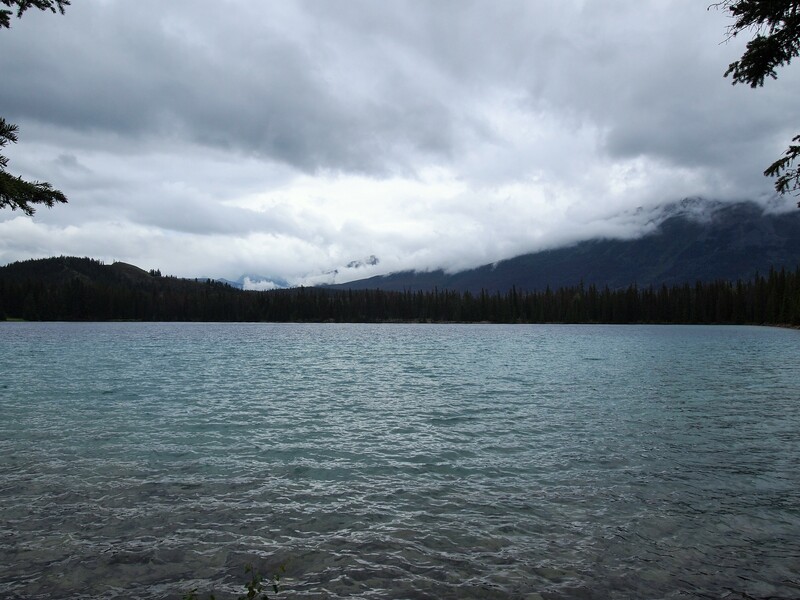 The rush of the water and overcast skies were sublime; it was the perfect combination. My favorite parts of the trail were clustered around Third and Fourth Bridges, but the narrowest, deepest sections of the canyon are at the top by First and Second Bridges. Here the tour bus crowds congregated to take photos, and I found it difficult to capture the depth and beauty of the gorge. 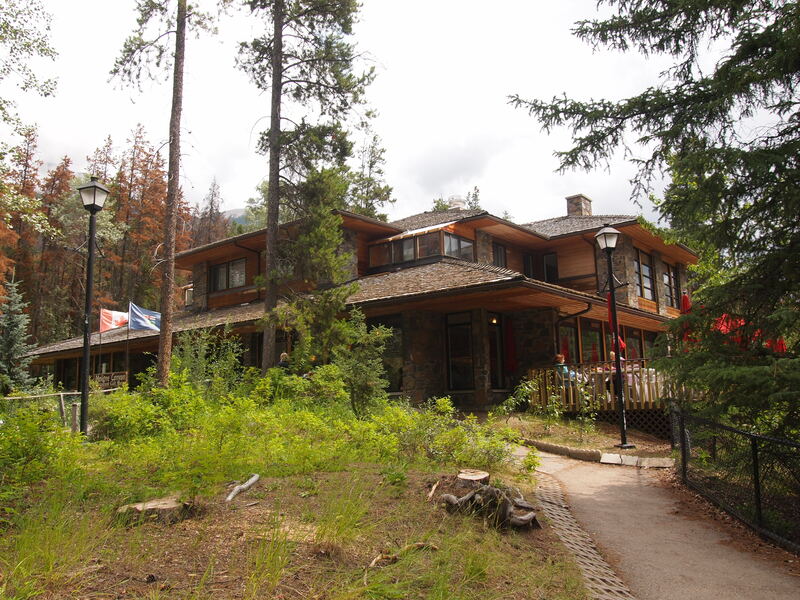 We stopped at the teahouse at the top to peruse the giftshop – which was teeming with people – before heading back down the trail. We were able to take a shortcut to bypass the trail between Second and Fifth Bridges which skimmed some time off our return. 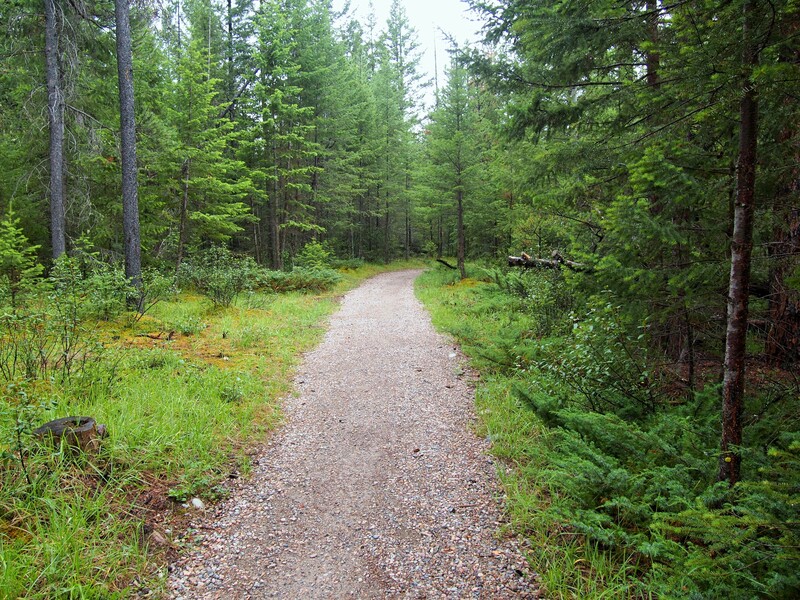 As we started down the side trail, it began to lightly rain, thunder began, and lightning flashed in the distance. As we reached the most exposed section of the trail, it began to pour. We dashed from tree cover to tree cover, hoping to avoid lightning strikes. We took cover for a little while when hail started to pelt us, but then continued on. We covered our backpacks and put on our jackets, but by the end of our trek we were completely drenched. We went back into town to re-group and figure out our next move. 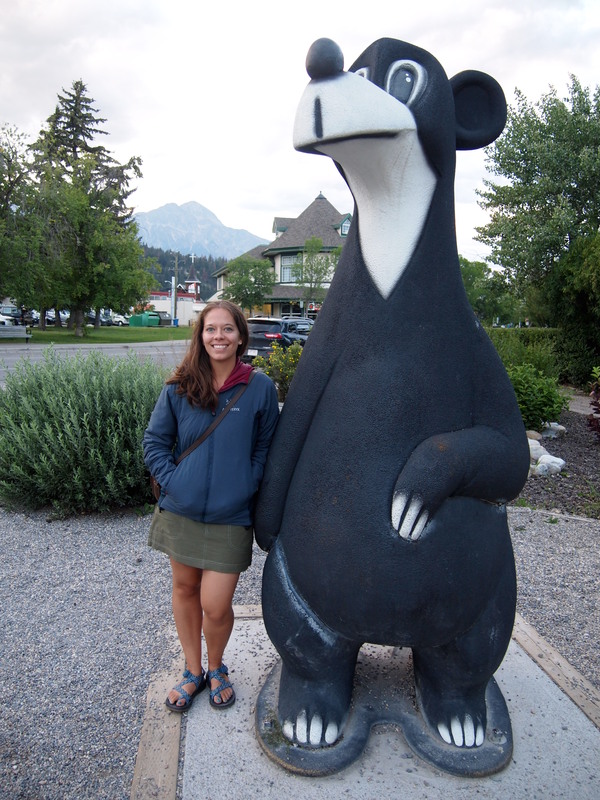 The rain had stopped, so we popped into the visitor center in town to grab a hiking map and ask for a recommendation. 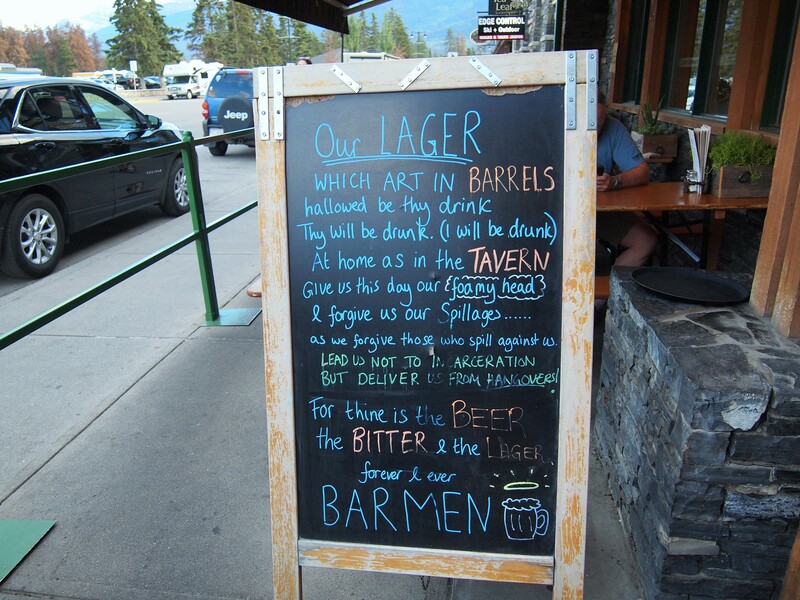 Since it was snowing at higher elevations and it was already late afternoon, the park ranger suggested we do a hike from Lake Annette to the Jasper Park Lodge where we could stop for a drink before going back to our car. That sounded pretty enticing. 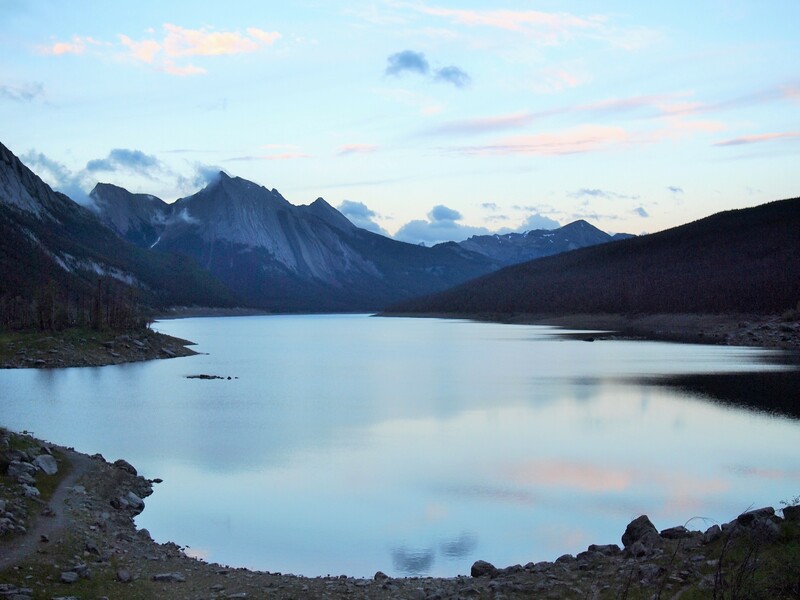 So, we hopped in the car and drove to Lake Annette. 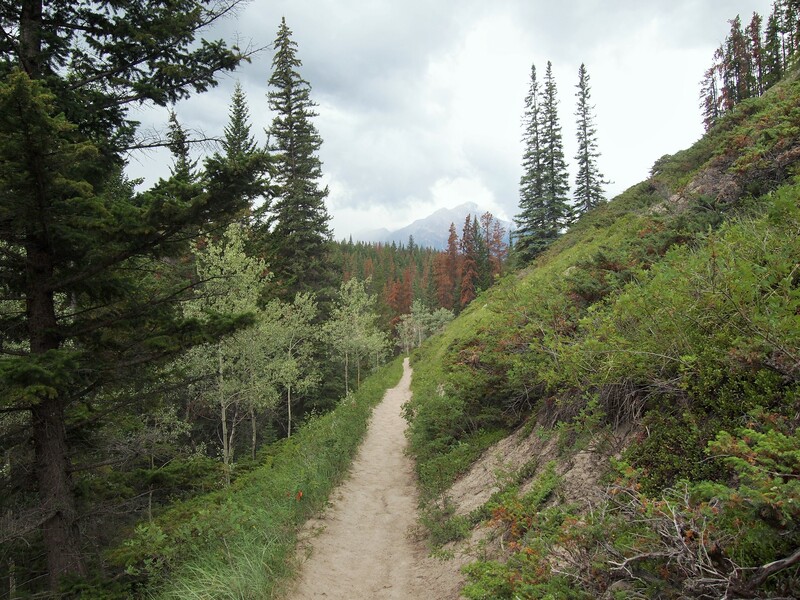 One of the other trails had recently been closed due to a grizzly attack on two mountain bikers. We were the only people out, so we kept our eyes peeled and made plenty of noise. 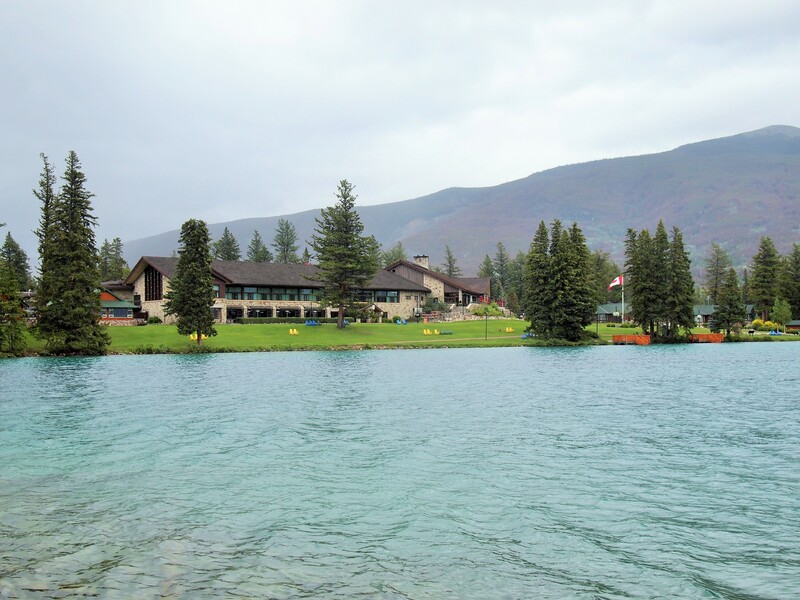 We had a pleasant walk to the lodge without rain. We were both chilled though, and it was wonderful to arrive at the lodge for a warm drink and a snack. 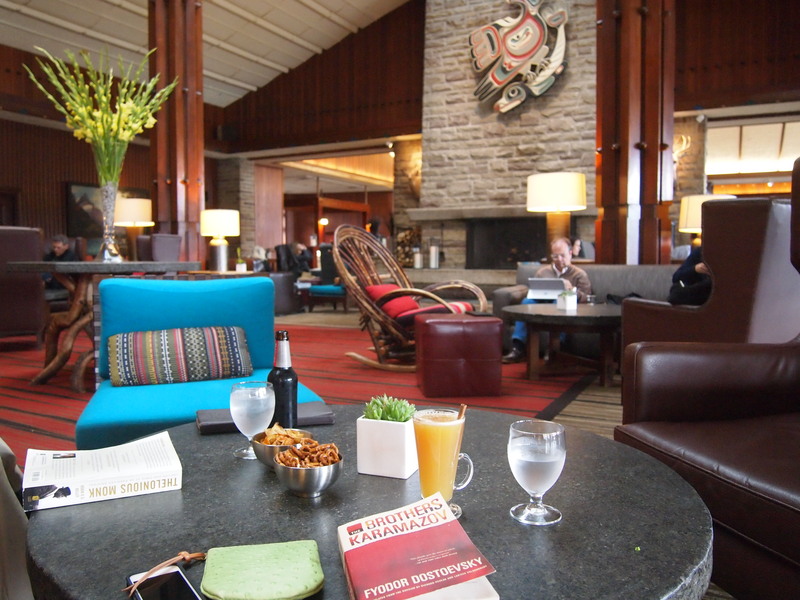 We plopped down in the lodge’s cozy sitting area, ordered a couple drinks and a snack, and stayed for almost two hours. While we were there it started to rain again – a steady, cold rain. I didn’t look forward to going back out. Instead of following the same trail back, I used my GPS to locate another trail, so we could turn our journey into a loop. 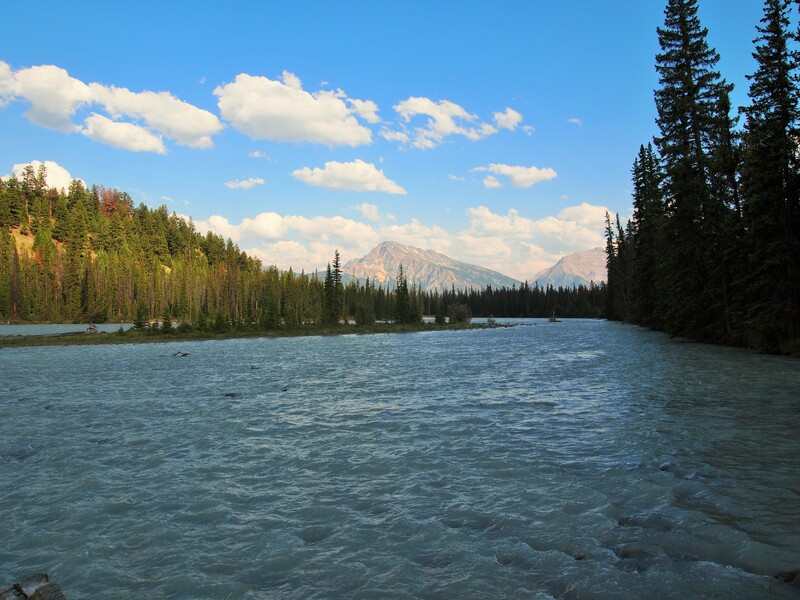 It wasn’t perfect, but it did give us nice views of the Athabasca River. While we were hanging out at the lodge, Zach checked the radar. 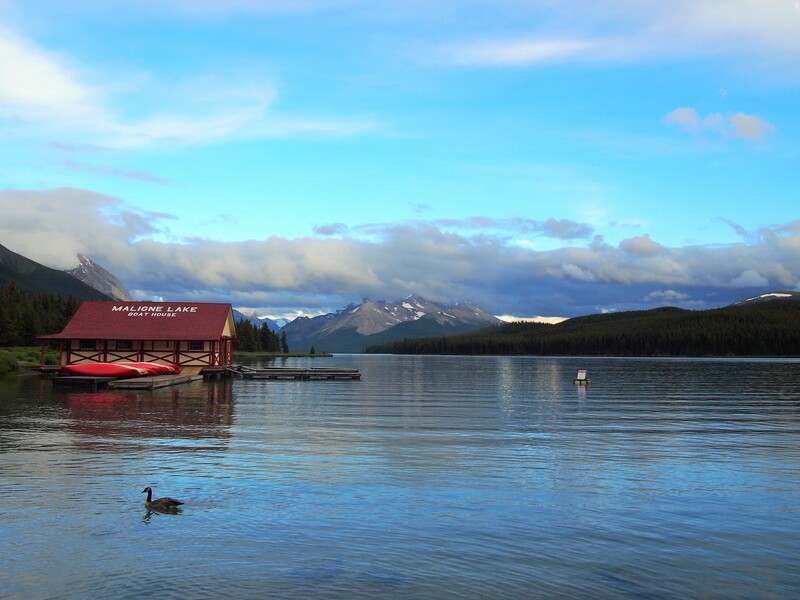 It looked like we might have a decent chance of catching Maligne Lake without rain. So, we decided to drive out and give it a shot. 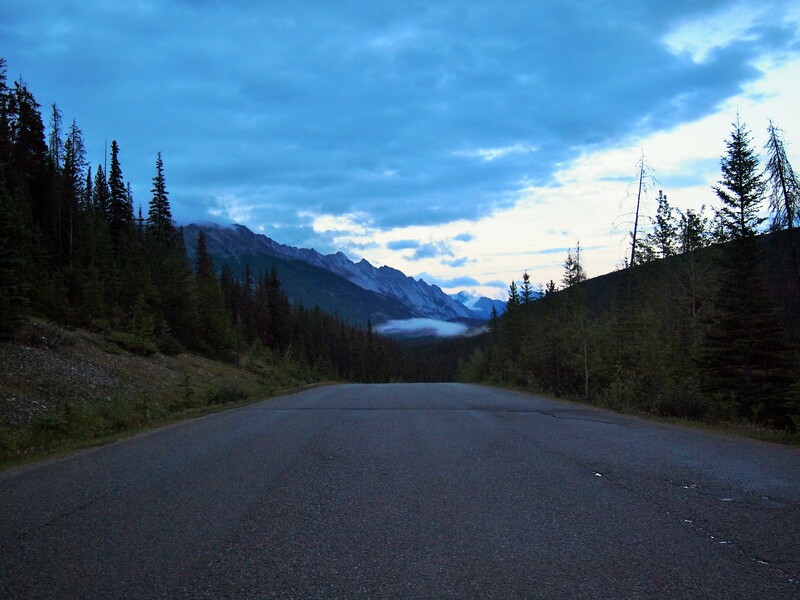 We felt more and more optimistic as we drove toward the lake; the clouds seemed to be clearing out and we could see blue sky! We arrived at the lake around 8pm. 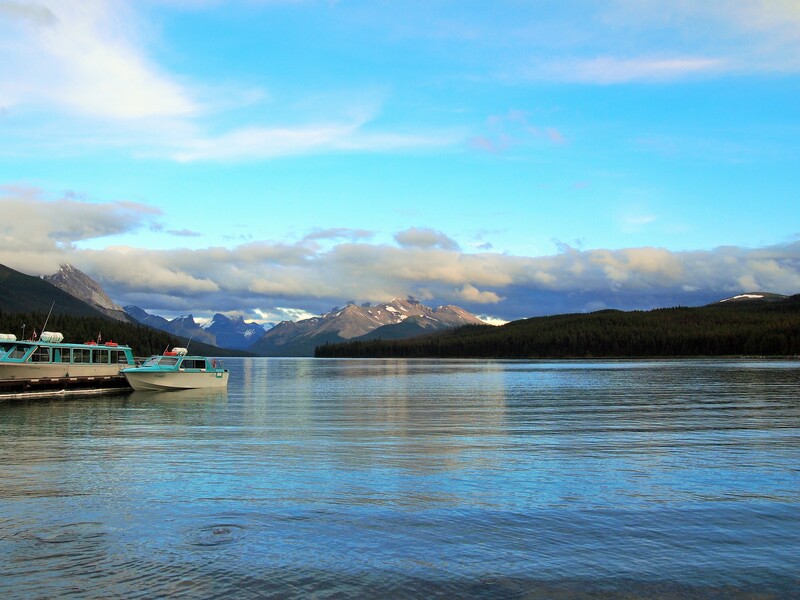 The crowds were long gone – the last tour boats go out at 5pm – and it was still. It was cold, 44 degrees, but we felt so lucky. 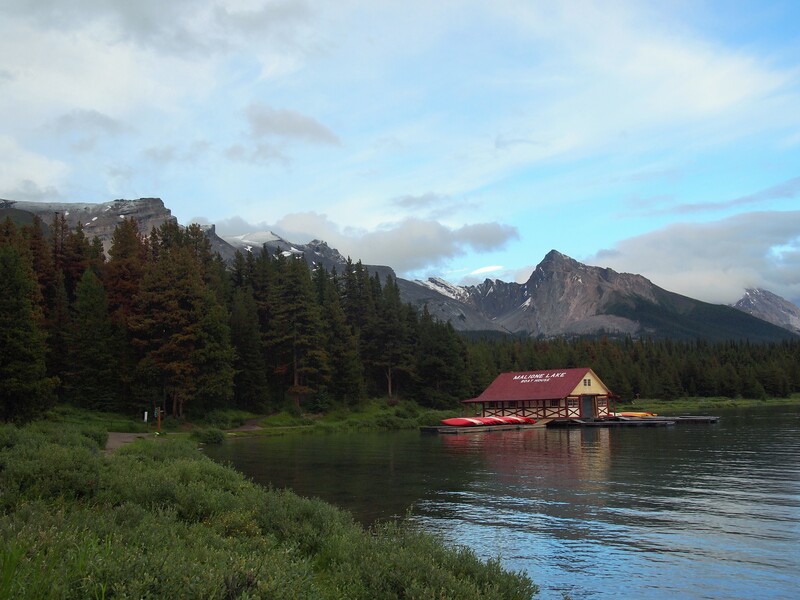 Maligne Lake is the top destination in Jasper NP. 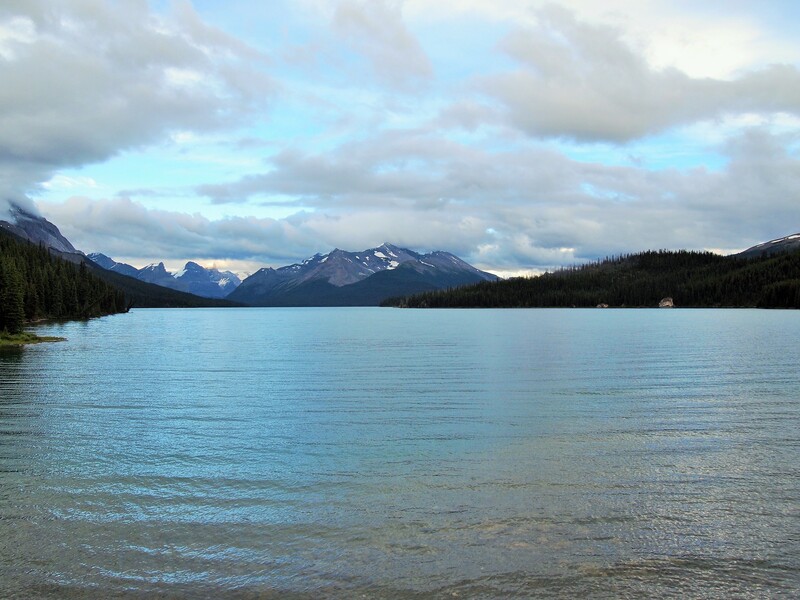 It’s the second largest glacier-fed lake in the world and largest in the Canadian Rockies. Most people take a boat cruise on the lake, but the late hour ruled that out for us. 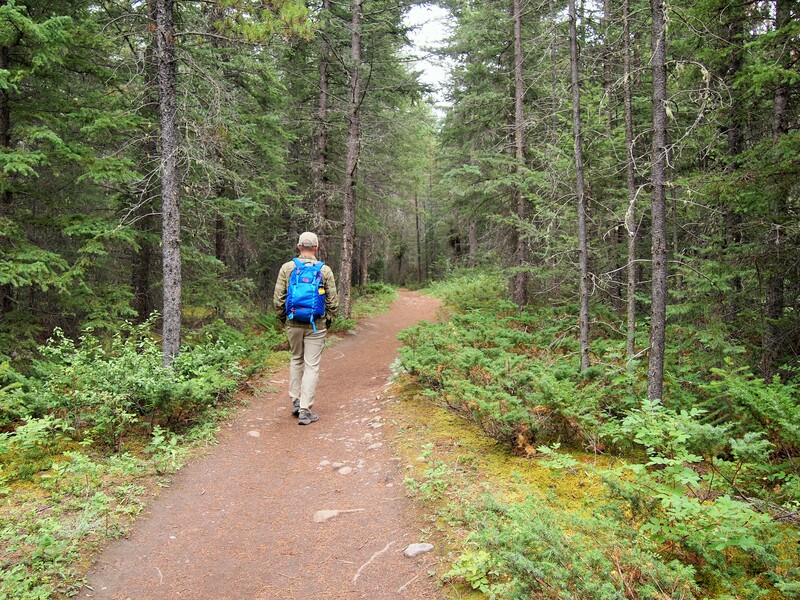 There are also several hiking trails in the area, but again, it was too late for that. 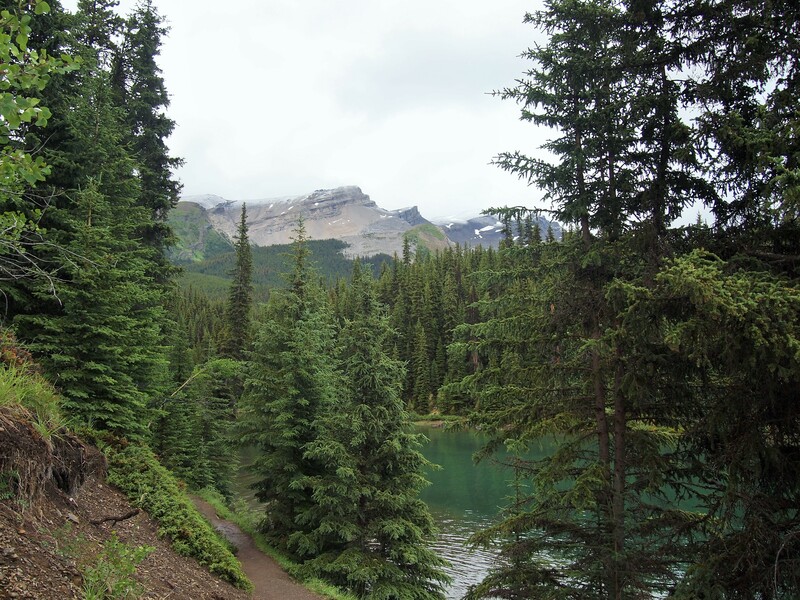 We followed a short trail which lead to a viewpoint on the east side of the lake. We were the only two people out, and it was magical. Tranquil. Sublime. Perfection. Everything. It was one of the most peaceful moments of my life. When we arrived back at the north end of the lake, there were only four other people out. The clouds had continued to clear out. 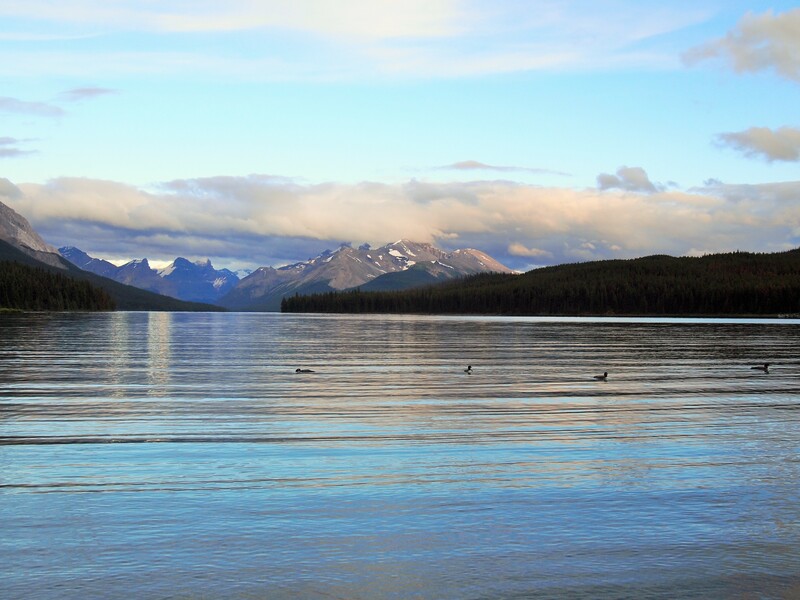 We actually stood there for a long time watching the sky, the view, and four loons bobbing around. We never did get a fully clear sky, but we still felt so fortunate. 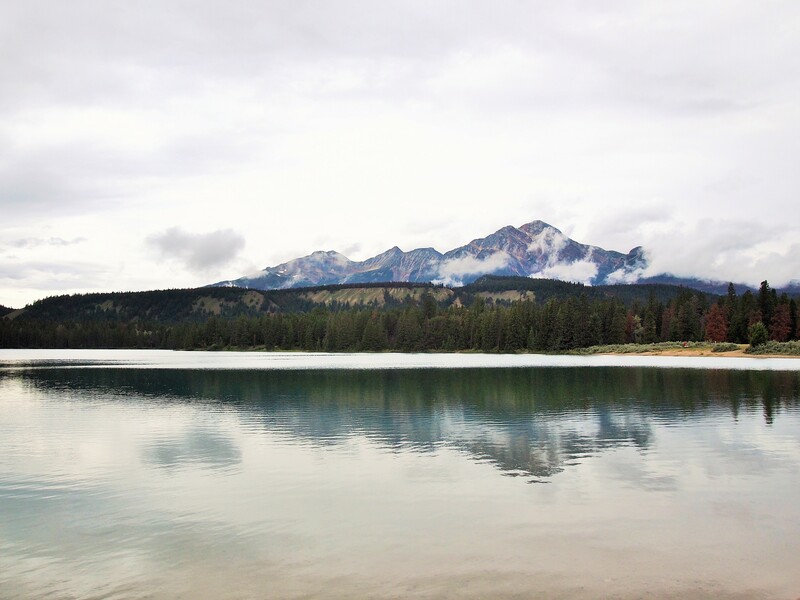 We left the lake around 9:30pm and drove into Jasper for a late pizza dinner. It was a beautiful end to a rainy day; we had managed to hike 12 miles despite the weather, but we held out hope for a clearer tomorrow.